Browsing trough catalogs are fun. We have created an archive with our sold items. Enjoy! Turkey dish ca 1880, Germany. Turkey for Thanksgiving, this Turkey dish from ca 1880. This looks to taste wonderful! I do not know, if it is a Chicken or a turkey or maby ? But it came from the table in a dollhouse from 1880. The furniture and accessories all from 1870-1890.The dish made of Composition on af porcelain plate. Size 10 cm / 4" Excellent condition. 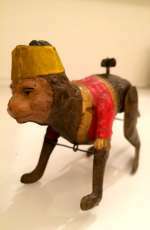 This antique "Papeterie" is wonderful in the doll room. It is dollhouse size or in doll size. 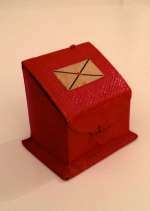 The "papeterie" is made of carboard and covered in red leather. It opens to see 4 "rooms" for paper, envelopes and here childrens drawings, too. It has a tiny pencil. The Papeterie was made ca 1880. Condition overall is excellent in the contains so charming. Size: H. 1-1/2"x D. 1-1/5"x W. 1-1/2"/ H.4 cm x W. 4 cm x D. 3 cm. 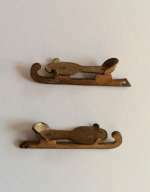 A pair of tiny antique ice skates for the doll´house. 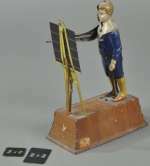 School boy "THE LITTLE CALCULATOR". 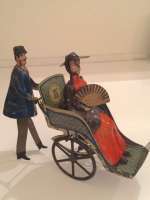 Rare toy w. clockwork from Tipp & co.
Lehmann “Going to the Fair” lady in riding chair. EPL# 290 1889, Germany. 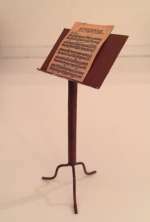 These very early string-wind drive toys were made from 1889 to 1896 in Germany by Lehmann. Combining lithography and painted detail, the toy features a red-gowned woman seated in a promenade chair with lithographed design at the side, being pushed by a porter with painted blue jacket and lithographed striped pants. The woman has a large hat, shawl, and dainty feet that rest on the decorated car base. Flywheel drive causes the wheels to turn and the man to push the cart along. Excellent condition woman, mechanism intact. Marked Lehmann. Comments: Lehmann''s EPL model 290, made only from 1889 to 1896, inspired by the International Exposition in Paris. Lehmann got the patent from Ferdinand Martin. ( there were also made a version with the lady dressed in blue with a red fan and a square loga at the back of the chair. Literatur: Heike Köhler/Katharina Kreschel: Vom störrischen Esel zum Kletteraffen Tom. Brandenburger Museumshefte 6, Brandenburg an der Havel 2007; Jürgen & Marianne Clieslik: Ein Jahrhundert Blechspielzeug, München 1981; Helmut Schwarz/Marion Faber: Bewegte Zeiten/Moving Times. Ernst Paul Lehmann-Patentwerk. Geschichte einer Spielwarenfabrik/History on a Toy Factory, Hrsg. Museen der Stadt Nürnberg 2003. Mandarin in the early version with hand painted coolies. Made by Lehmann before 1920 in Brandenburg. 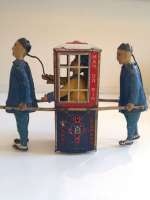 This windup toy features two coolies walking along with natural leg motion carrying a man seated in a highly decorated box. The man in the box is holding the pigtail of the front coolie, presumably confirming his superior social status. Wind up. Working fine.Good condition. Only minor wear. L. 7 inch" W. 7" (17,5x 17, 5 H. cm) Literature:see Heike Köhler og Katharina Kreschel,Von Störischer Esel zum Kletteraffen Tom.Brandenburger Museumshefte 6,Brandenburg an der Havel 2007. Jürgen & Marianne Clieslik,Ein Jahrhundert Blechspielzeug,München 1981. Helmut Schwarz og Marion Faber,Moving Times,Ernst Paul Lehmann Patentwerk,,History on a Toy Factory,Toy Museum Nürnberg 2003. Early handpainted monkey ca. 1910. When the clockwork is activated he springs around. A very charming toy! The condition is great . Ca 1910. Length. 6"/ 15, 25 cm. Probably made by Günthermann, Germany.